Yesterday afternoon, in response to a question about the HTC One’s availability on Verizon, the official HTC USA account essentially shot down any chance at the device arriving in the near future. This news comes on the heals of a report out of AllThingsD, which suggested that there would be a Verizon HTC One after all, but that it wouldn’t be for a couple of months as Big Red needs to finish up their extensive testing on it. A day after that report, we also caught wind from a source out of Walmart, who gave us a document showing that the big box retailer was expecting an HTC One variant to arrive this month that would replace the DROID DNA. We remained skeptical at the time, and you can see why. But while HTC has done their best to shut down One-Verizon rumors, we do know that a new Verizon device is in testing with almost identical specs to the One. It’s currently carrying the code name “DLXPLUS,” which is very similar to the DNA’s codename of “DLX.” This device has already cruised through Bluetooth SIG and popped up through HTC insiders. If it’s not a One, don’t be surprised if it’s called the DROID DNA+ or something of that nature. There are no current rumors of a release time frame, but we’d imagine it won’t be too far out. 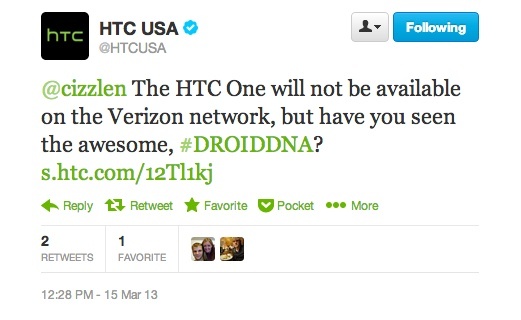 Then again, you would think HTC would want their flagship One out before Verizon does their own song and dance. The One isn’t expected to arrive until April.